The Global Property Guide looks at inheritance from two angles: taxation, and what inheritance laws apply to foreigners leaving property in Norway: what restrictions there are and whether making a will is advisable. How high are inheritance taxes in Norway ? Inheritance and gift taxes were abolished as of 01 January 2014. Until 2013, inheritance tax is levied on the net amount of the inheritance received by beneficiaries, which is generally calculated at market value. The beneficiaries are liable to pay the inheritance tax. The rates are progressive, depending on the relationship between the deceased and the beneficiary. Inheritances between spouses and cohabitants are not taxable. What inheritance laws apply in Norway ? Norwegian inheritance laws do not affect everyone owning property in Norway. Act on marriage, April 7 1991 nr. 47 (Marriage Act). The Hague Convention of October 5 1961 on the form of wills. Norwegian national inheritance laws, cited above, do not affect everyone owning property in Norway. Succession generally follows the principle of lex domicilii i.e. the laws of the state where the deceased had his/her last domicile apply to inheritance issues; however, the judge can make an evaluation, after which he can choose the law of the deceased's nationality instead, following the principle of lex patriae. The criterion for this evaluation is whether the deceased was not domiciled five years before the time of death in a country different from his/her nationality. There is an exception with respect to real estate. If there are special non-conforming inheritance rules in the country where the real estate is located, these particular rules apply, insofar as necessary, even if this country is neither the domicile, nor the citizenship state, of the deceased. Norwegian authorities have enforcement jurisdiction over property located in Norway. No distinction is made in Norwegian law between movable and immovable property. There is no legislation to deal with questions concerning the choice of law, or the legal jurisdiction, with respect to the ownership and inheritance of property by foreigners in Norway. In accordance with the principle of lex rei sitae, legal issues concerning real estate are resolved by the law where the property is physically located. Consequently, Norwegian courts are competent to adjudicate property law in cases where the property is located in Norway. The legal venue is the judicial circuit where the property is located; however, the prevailing opinion is that a Norwegian probate court, as a starting point, cannot manage the decedent's estate if his/her domicile (permanent place of residence) was not Norway at the time of death. In principle, therefore, cases involving foreigners who reside outside Norway would, in the first instance, be dismissed by the Norwegian probate court. The facultative principal rule is that if the inheritance issues concern a foreign defendant, then the suit must first be filed before the foreign defendant's home court. The jurisdiction principles cited above do not apply when property in Norway constitutes a part of an estate complex, since NIPL is founded on the principle of universal succession, not scission. NIADE applies if the deceased had citizenship in one of the five Nordic countries, and his/her domicile was in one of these countries at the time of death. NIADE lays down the lex domicilii principle as the main rule for internal Nordic relations. It regulates the administration of the deceased's estate, and the administration of the undivided possession of an estate for the surviving spouse. Pursuant to this convention, the administration is carried out in the Nordic state where the deceased, or the surviving spouse, had domicile at the time of death. The NIADE does not apply to foreigners who had citizenship or domicile outside the Nordic states. It is not clear whether "renvoi" will be accepted in Norway. If the inheritance issues of a foreigner who owns property in Norway are referred back to the Norwegian legal system, it is not clear whether such a "renvoi" will be accepted by Norwegian judges. The prevailing opinion is that if the law of the foreigner's domicile or citizenship applies the principle of lex rei sitae to inheritance issues, then the renvoi will not be accepted, and Norwegian law will not apply to the distribution of the foreigner's estate. In rare, complex cases, the question of renvoi may be decided according to the judge's holistic evaluation of legal and practical arguments, including reference to rules in Norwegian law. The renvoi question may also arise if the law of the foreigner's domicile or citizenship applies the principle of lex patriae. In NIPL this question has not been debated to a large extent, and is even more open than the one above. A similar type of evaluation will probably be the solution. The time taken to complete inheritance proceedings is variable. As to the timeframe for international inheritance cases, it is not possible to give a general answer. It depends on factors as the size and contents of the estate, the domicile state's legal system, and last but not least, the involved states' collaboration abilities. "Reserved portions" are provided for in Norwegian law. Norwegian law provides for two types of statutorily prescribed shares of the estate or "reserved portions". One share is for the surviving spouse and the other for consanguinity. The spouse is entitled to a minimum portion of the estate. The economical value of this right is dynamic. Firstly, it is connected to a basic amount, which the national assembly determines each year. Secondly, it varies according to who the other inheritors are. The reserved portion for the descendants is, as a basic rule, two thirds of the deceased's estate. The shares must not amount to over 1,000,000 NOK for each line of the succession. It is necessary to yield remote descendants at least a 200,000 NOK share. The spouse and descendants inherit the entire estate in the absence of a will. If the deceased is intestate, the above-named relatives will principally inherit the entire estate. In general in the absence of a will, the law will distribute the estate on the grounds of an assumed will of the deceased as well as conflict suppressing and social considerations. In case of intestacy of a foreigner who owns property in Norway, the law of the country in which the deceased had his domicile determines the rules for the distribution of the estate. It is not advisable for a non-resident foreigner to make a will in Norway. Family law governs property rights in Norway. The lex domicilii principle applies to questions of property between married people. The law of the first joint domicile of the spouses after marriage is the applicable law. Thus Norwegian family law may apply to married foreigners if their first domicile is Norway; however, if the spouses are non-resident foreign owners, then the law of their domicile is decisive. If matrimony is ended by separation, divorce or death, a community of assets is manifested insofar as the spouses do not have a marriage settlement on separate estates. A married property owner must have a spouse's written approval to dispose of the family home, regardless of ownership. Incompatible dispositions can be set aside. Gifts among spouses must be given in a written marriage settlement to be valid. If one spouse is insolvent, a creditor can pursue the other spouse for the value with which he/she has been enriched through gifts from a debtor. Furthermore, there is a vast body of rules protecting creditor's interests in case of insolvency. Inter alia this comprises rules on gifts. 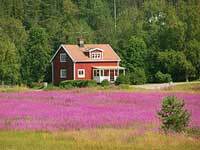 Norway has rules on the surviving spouse's right to an undivided possession of an estate. The presumptions for this are that there is a lawful marriage, and a community of assets between the spouses at the time when the predeceased died. In international private law this may raise complex choice of law issues. Norwegian law distinguishes inter vivos and mortis causa dispositions. A mortis causa (after death) disposition must satisfy the provisions of the Inheritance Act. If these requirements are met with, the rules relevant to inheritance e.g. reserved portions, apply. An alleged inter vivos disposition (during the lifetime of the owner) can be contested as a mortis causa disposition by persons who have a legal interest in doing so. The result may be that the disposition is set aside, or altered by the rules applying to inheritance. Norwegian law includes equitable ownership. Pursuant to Norwegian property law, the owner is, as a starting point the person who has equitable ownership. Written formalities e.g. the name of the person on the title deed, are not necessarily decisive; however, equitable ownership is a dynamic concept in many respects, and there are rules regarding prescriptive title acquisition after common usage and bona fide purchase of property. Minors require a guardian or trustee. Every person under 18 who is resident in Norway must have a legally appointed guardian or public trustee's office managing his/her assets. For a non-resident child, the domicile principle applies. Everyone pays tax on inherited and donated real estate located in Norway. 20% per cent for the surplus. How high is income tax on residents in Norway?